This is but a taste of what the Seattle Knights can offer: fanciful and legendary characters from the elaborate world of Tir na n'Og, or ones born of history and fantasy, fighting for Queen and country, each brought to life with passion and exuberance. The excitement will have any audience cheering for their favorite knight as he or she enters the field of honor to face an equally skilled and determined opponent. 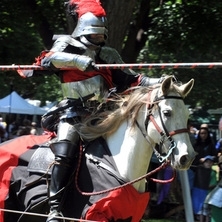 The Seattle Knights combine equestrian thrills, high-energy acting, and choreographed stage combat using real weapons and armor. ​We offer a variety of special show packages, any of which can be tailored to fit your individual needs and budget. For more information about the shows we offer and the types of entertainment we can provide, click here.